What does healthcare digital marketing look like? It all starts with a focus on creating great healthcare content that pulls people to your website where they can learn more about your products and services no matter where they happen to be in the Buyer’s Journey. DVR’s, satellite radio, spam filters, and do-not-call lists have made it increasingly harder to get through using traditional advertising, also called outbound marketing. The Inbound approach to Healthcare Marketing: Market with a magnet, not a sledgehammer. Building trust, not skepticism among your prospects. Being loved, not ignored by your customers. Outsmarting, not outspending your competitors. Unsure of where to go next? Our full inbound healthcare digital marketing service starts at $5,000 per month. We understand that online marketing can be overwhelming. If you’re having trouble making sense of it, let us know. We’ll still consider it a win if we can point you in the right direction or get you some practical advice. Create targeted content that answers your customer’s basic questions and needs. Share that content far and wide. Recognize that prospects go through stages as they interact with your company, and that each stage requires a different voice and marketing actions. 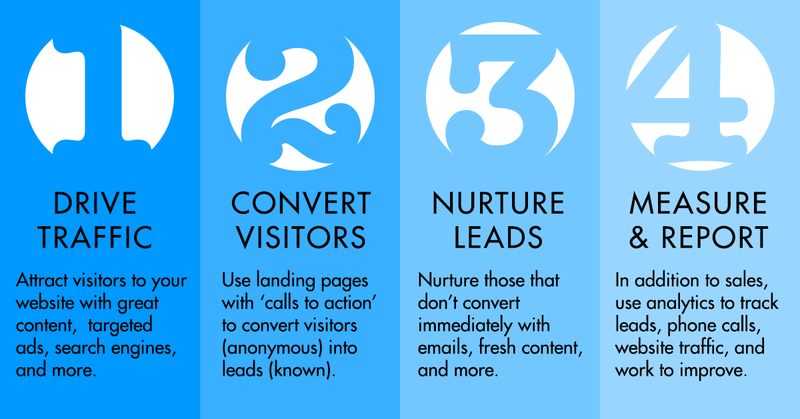 Learn more about your leads over time, and personalize your messages to their specific needs. Healthcare digital marketing should be multi-channel – it approaches people where they are, in the channel where they want to interact with you. Publishing and analytics tools work together like a finely-tuned machine, allowing you to focus on publishing the right content in the right place at the right time.